Honestly, i never thought we would come to this moment. I nor anyone else in our band never wanted to take anything from anyone. We’ve always done this to connect with people through our shared issues. That hasn’t changed. We’ve always done everything ourselves. Put ourselves in debt time and time again to continue touring, not cancel shows and to do anything we’ve said we are going to do. We’ve been a touring band for a long time now and it always seems like the hits just never stop coming. That being said, sticking to our commitments is beyond important to us. Making music that connects us with other like minded people has been goal number one from the beginning. This has never and will never be about making money. We all live frugal lives to continue doing what we do. Not because we have to but because we want to. The time has come when we have no other options but to reach out to our friends & family for help. Recently on our last out of town show the van started shaking uncontrollably before reaching a certain speed. Obviously we were terrified. We ended up having to be on the road for 8 hours as apposed to 5 because we couldn’t get the van above 55 MPH and had to get home. We took the van in to get fixed because we have a tour coming up down to SXSW and back. Its going to cost us about $2,300 to get fixed which is a ridiculous amount. Essentially everything that makes and helps the van’s wheels move straight is broken, or needing repair. We in no way were prepared to receive such a overwhelming estimate. The bill coming back as heavy as it did is beyond crippling to us. We are still in debt on the van and cannot get rid of it or trade it in. I hate to reach out and ask the most amazing people we know for help but, we need it. We never have been in this for personal gain and never will be. We payed for the recordings out of pocket and it broke our bank as a band. We recorded this latest album for everyone including ourselves. Its our attempt to connect with people who are struggling because we are struggling. We’ve been financially recovering ever since. Now with this its just a drop into an already empty bucket. We need your help. This page will only be up for one week because we leave for tour in two. So please, please share it around. Any amount helps. Anything helps. If you can’t afford to donate please share it around. We know some people are not going to agree with us doing this but we don’t have another option. Im sorry to ask any of you for anything but we need your help right now. Anyone who donates will receive a free download of a brand new acoustic song. Sadly this song is not off our new record, and all those songs have yet to be heard or realized. As a way to give back in general we are going to put the song up for free streaming for anyone to listen to for free. Thank you so much for reading this, for sharing, for donating it. We could no express in simple words how much that means to us. 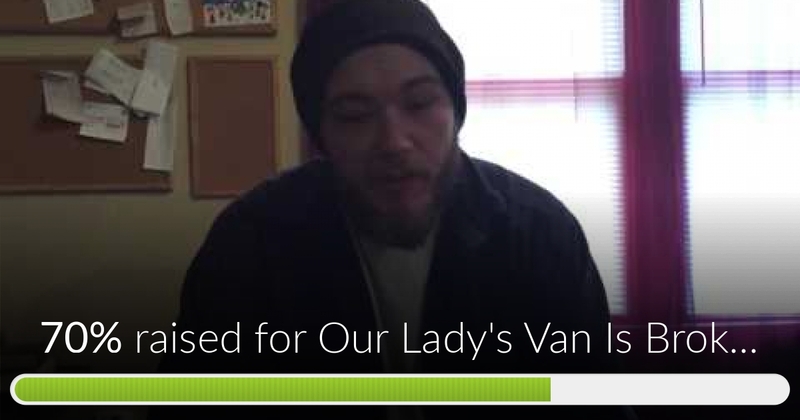 Our Lady's Van Is Broken has reached 70% of its goal. Thanks to Angie, Bubba and Everyone else who donated!